From the moment I arrived I felt welcomed. Very conveniently located to where the bus stops. Very short walk to one of my favourite dunes in the area. The host was extremely friendly and kept saying 'welcome home'. I did feel at home and he extended free the facilities after checking out and returning from the desert. Top notch spot. It was so awesome and cozy place. I arrived at 9:am. The check in time is 2:00pm. But he’s checked in me at that time early morning. And He upgraded my room as double bed big room. The breakfast was so nice and there is a shop to buy some snacks and other stuffs. I definitely prefer to stay this hostel in Merzuga. 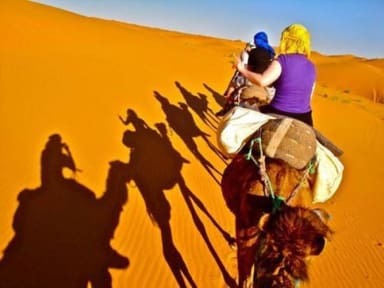 And they organized nice camel tour, they has many tour as sahara desert camp, camel, nightsight, sunset tour,etc. They will provide as good price. Thank you for all. We were originally going to spend 2 nights here but enjoyed it so much that we booked a third night. Our bus arrived at 5:30am and Youssef, the incredibly hospitable owner, met us and let us use the room immediately. A 5 minute walk to the dunes, you can admire them while sitting on the terrace eating the huge breakfast provided. Highly recommend the desert trip organised by Youssef and his dinners, which are large enough to feed a small army, at a very good price...just make sure you're hungry! Youssef was a fabulous host - we couldn’t have asked for a better experience! Just outside of Merzouga, his place is in a quiet little town that gives space to enjoy the dunes in peace. All kinds of tours are available from the hotel itself, so no need to take those long trips from Marrakech. He offers a delicious breakfast and makes some of the best food for dinners we had on our trip. A must-stay place when taking your Sahara excursion! Awesome place!! Yousef was an amazing cook and set us up on an awesome tour of the desert!! Highly recommend! I wish I could give staff 11/10 - Youssef went above and beyond to make our stay at Kasbah de Dunes amazing and our Camel trek the memory of a lifetime! Youssef made sure we had everything we needed and set up a trek super last minute that fulfilled every expectation I had and more. Mohamid (our guide) made the trek awesome - he was full of riddles, made amazing food for our entire journey and was killer at the drums! This place was amazing, Youssef was really hospitable and worked to involve everyone in social activities and he himself made efforts to talk with myself and other guests - great for single travellors like me. Through the hostel, lunch and dinner (amazing tagines) each day were prepared for me and a night in the desert on the camel trip as well. The place was clean and very cheap for a single room with ensuite and air conditioning. I couldn't recommend this hostel enough! The host was lovely and helpful and arranged a night in the desert for us the day we arrived no problem :) he also helped us change our bus tickets and was OK with us leaving a day early and gave us a discount on the price (our flight times had been changed on us). Overall lovely place right on the edge of the Sahara. Kasbah Des Dunes was clean, convenient and cheap but, the real treat was the wonderful and welcoming staff, who are more than willing to do just about anything to make you feel at home, and the home cooked meals. I went a little off season so no real atmosphere but, they still tried to make it fun when I was there which was nice.